My niece is currently smack bang in the middle of her final exams for the NSW Higher School Certificate (HSC). Given her academic prowess to date, I expect she will do quite well. It is now 25 years since I completed mine, and graduating in the class of 1989 from my high school. Whilst a little nostalgia is not lost on me, I am always amused by the kinds of triggers which remind of past events or stages in my life. In this case, surprisingly, it was not my niece and her exams, rather, noticing a black coffee cup residing in the back of the cupboard. The cup you see, was given to me by my sister, with the aim of helping fuel the study sessions for my own HSC. The cup itself, meaning no disrespect to the item, nor the gift giver, is simply a plain, black, nondescript cup manufactured by Arcoroc . It is fairly small, light, and well…just black. At 8oz or 250ml in capacity, it is – 1 cup. 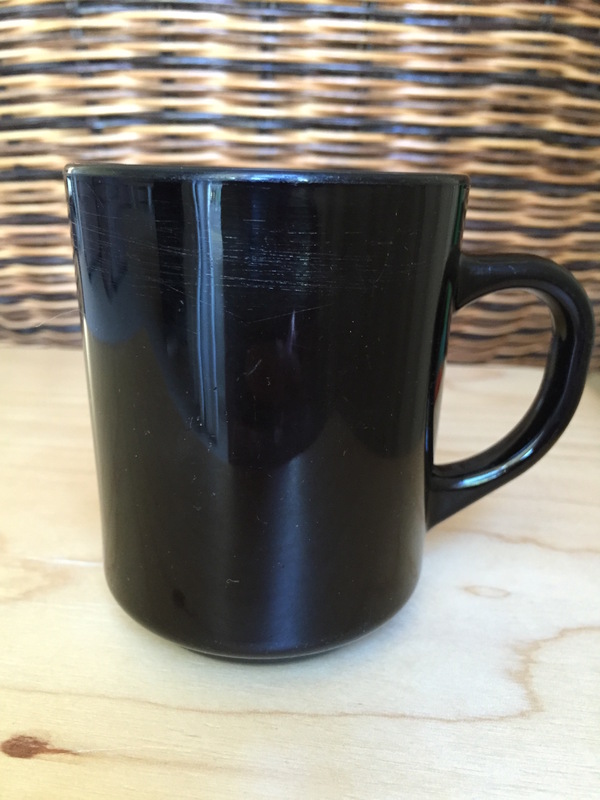 Although the cupboard is full of varying cups, glasses and mugs of all shapes, sizes, designs and colours – none mean as much as the black cup in question. Why so? As you have no doubt worked out yourself, this cup is now 25 years old, and save for a few scratches is pretty much as good as the day I received it. It has been with me through my own HSC, eight years of University yielding two Degrees, and a further 17 years of employment. The cup a constant companion throughout, having only been relegated to the cupboard about 18 months ago with the purchase of my AeroPress for coffee brewing at work. Unfortunately the filter cap of the AeroPress is a little too big to fit on top of the cup, necessitating the need for a replacement. The funny thing is, only now having realised the vintage of this cup, does it now make me a little nervous about possibly breaking it. Prior to this, it had been thrown in and out of work bags, office re-location boxes and office drawers. I do recall it also being dropped quite a few times, however it remains in one piece. The significance of this cup now? In many ways a reminder that where I am now is the sum of everything up to this point. Most of which I owe to those who set me on this path. Those who supported, guided, and gave me either everything I needed or the means to acquire it myself. It is not a priceless family heirloom, holding far more value to me than that. We proceed through life not merely for ourselves, but for, and because of the “us”. The family we began with, and the families we ourselves create. The gift of this cup came at a time when I was about to leave a small town home and move to a city. A time where my day-to-day life would change substantially. To say this was an “adjustment” is probably somewhat of an understatement. During times like those, the constants and familiarities are reassuring, and provide a little reminder of the “why”, along with that little push of support to help with the “how”, and you keep moving forward. In these times, that little black cup is a reminder of those times, and because of those times I can now sit back and smile. “We” did it. Upon moving out of this house, neither of my children may wish to inherit the little black cup, but what it contains will travel with them far and wide wherever they go. To my niece, best of luck in the rest of your exams.